Management of the Housing Authority of the City of Live Oak was introduced to the Instakey Security Systems Key Control Program at the 2008 FAHRO Annual Conference. Executive management for a previous InstaKey Housing Client, the Daytona Beach Housing Authority, had recommended the InstaKey Program to the management of the City of Live Oak. 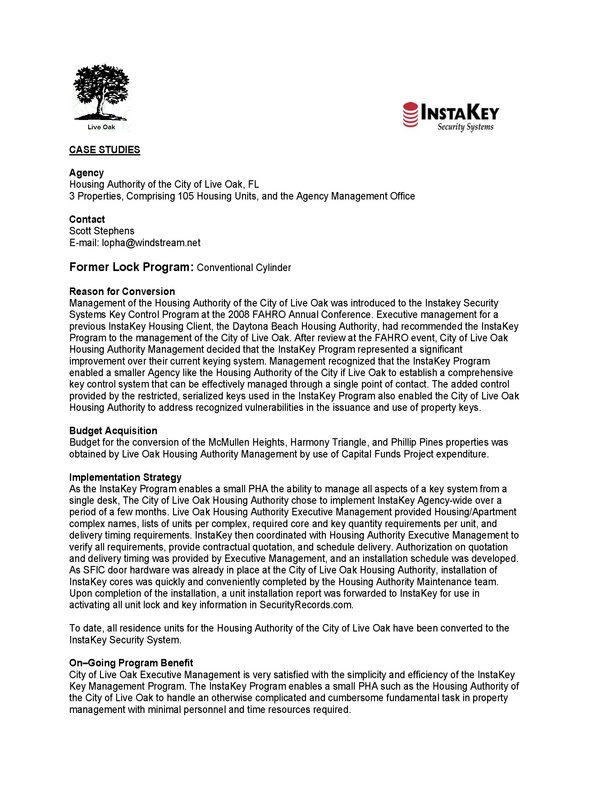 After review at the FAHRO event, City of Live Oak Housing Authority Management decided that the InstaKey Program represented a significant improvement over their current keying system. Management recognized that the InstaKey Program enabled a smaller Agency like the Housing Authority of the City if Live Oak to establish a comprehensive key control system that can be effectively managed through a single point of contact. The added control provided by the restricted, serialized keys used in the InstaKey Program also enabled the City of Live Oak Housing Authority to address recognized vulnerabilities in the issuance and use of property keys.